While both electric slide-in and stand alone ranges have the same basic function, they possess different features. For instance, one range works better for custom applications, while you can remove the other from its packaging and place it anywhere in the kitchen. The features of each electric range function as deciding factors when you attempt to pair the appliance with your lifestyle, kitchen space availability and cosmetic preferences. Stand-alone ranges have a finished back and sides. Electric stand-alone or freestanding ranges offer a finished back and sides. Manufacturers place the controls of a stand-alone either on a back console that extends upward from the cooktop or on the front of the electric range above the oven door. 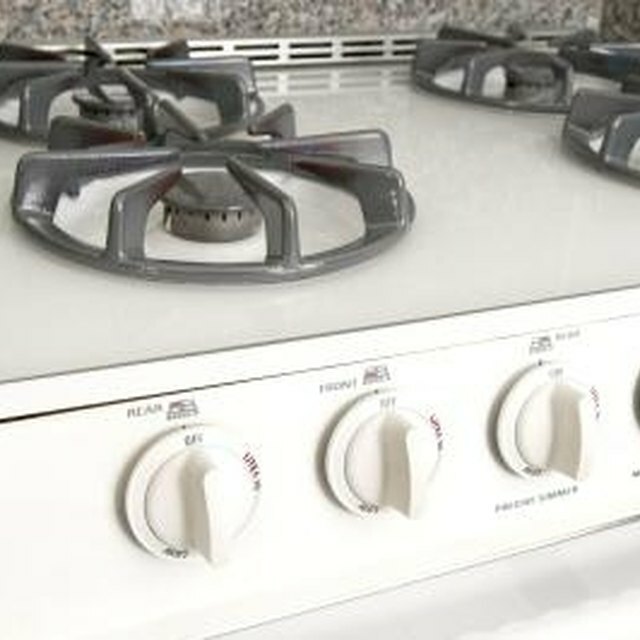 Manufacturers offer stand-alone electric ranges in a standard 30-inch size and in oversize commercial models with more burners and extra features, such as a griddle. An electric slide-in range lacks the finished back and sides of a stand-alone or freestanding electric range. The width of the body of the range measures approximately 30 inches. A slightly wider cooktop, which rests on top of the counter tops, eliminates any space between the counters and the sides of the range. This proves helpful in preventing food and cooking tools from falling in between the appliance and the cabinets. The range controls sit on the front of the body, above the oven door. The electric slide-in range works best in a kitchen that offers a standard, existing 30-inch-wide space between cabinets, which may not be present in an older home. If not, you can build or remodel cabinets to accommodate the range. You can also add a slide-in range to an island for a custom, built-in look. For between-cabinet applications, the body of the slide-in range nestles in between the two cabinets, but leaves room between the back of the cooktop and the wall, since no back console exists, as with a freestanding range. Solutions for the gap include installing a piece of countertop or applying a filler strip to the area. Overall, the slide-in range offers a built-in look. Freestanding or stand-alone electric ranges offer homeowners the ability to place the appliance in an open area, with sides and back exposed. Placement at the end of a row of cabinets also works. Antique ranges fall into the stand-alone range category. You can place freestanding ranges between cabinets, but the cooktop is not as wide as a slide-in, which results in gaps between the cooktop and cabinets on either side. What Is a Built In Refrigerator?